I finished up my rainbow scrap quilt on Friday night. I started sewing 6.5" scrap blocks in the summer of 2011 when I still lived in Kansas, and ended up with 120 of them at the Seattle MQG quilt retreat at the beginning of February. I made one more block at the retreat and sewed together the quilt top there. 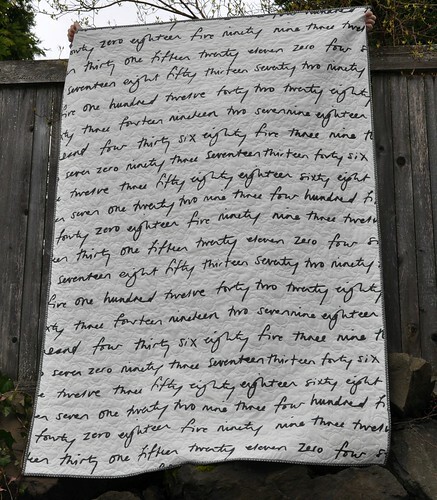 It's about 54" x 78". I used the famous Ikea numbers fabric for the back. I was really happy that it was wide enough for the back of this quilt! I love making pieced backs for quilts, but it was nice to not worry about that this time. There is enough happening on the front of this quilt, I think. I decided to do a more open quilting design this time, and came up with this flower and loop free motion quilting design. I think it was more difficult than doing a simpler all over design like loops or stippling, because I had to look ahead and figure out where the next flower should go. And the quilting wasn't always easy to see with such a busy quilt top. I kept track of my time and it took 207 minutes to quilt, and 5 bobbin changes. The binding is a sort of grungy gray dot fabric. And... there's a funny mistake in this picture, want to see up close? While I was quilting, the edge of the backing fabric got flipped over and caught in the quilting stitches. I just trimmed the fabric close and left it for now. I was not in the mood to unpick anything when I got to the end of the quilting. I'm so happy this quilt is finished! And now I'm planning to try something else with my scraps for a while. I've already started cutting 2.5" squares from a lot of my scraps. I don't know what I'll make with them but I'll figure out something good. What are you doing with your scraps? 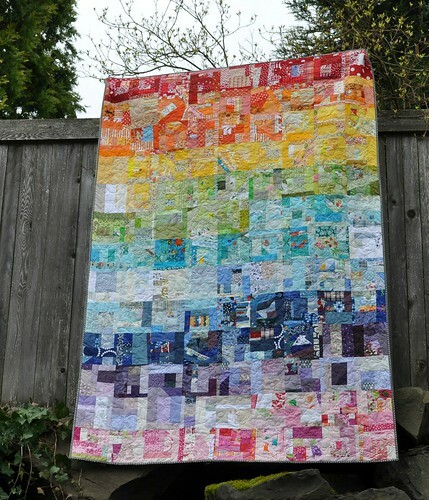 Your quilt is beautiful and a great idea too. I am inspired to make something similar. And the funny mistake with the backing being flipped over and quilted? I think I've done that on 3 different quilts! I leave a lot over overhang on my backing fabrics. I love your quilt! Great job using up all those scraps. 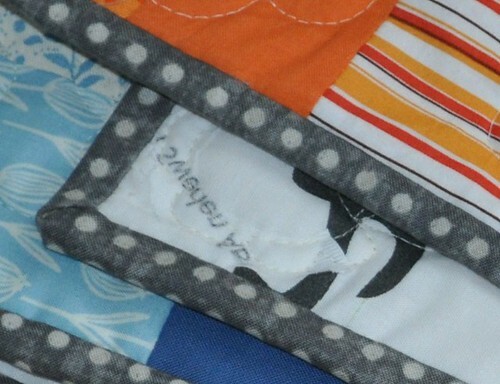 I love how scrap quilts make a sort of eye-spy quilt for you and your kids to find fabrics you remember. Love it! I liked hearing about how long it took you to quilt, too. And the binding fabric is great! LOVE this - pieced fabrics from all your 'memories' put together to truly be a cherished heirloom. (Not that all your quilts aren't already but you know what I mean!) You should be so proud it's lovely. This is delightful and so meaningful. Great job. I've had that backing caught up in the stitching issue before, too. Solved it the same way you did. Aggravating for sure, but we are nothing if not problem solvers! This quilt is awesome! It came out beautifully. What a lovely way to preserve those memories! Love your blog. 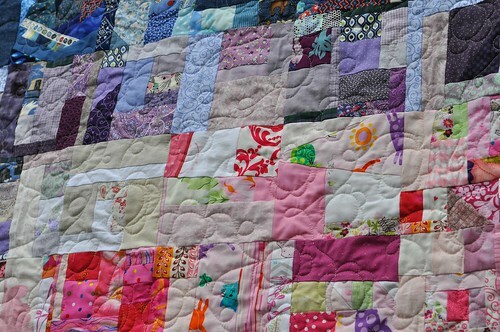 You have a very pretty quilt and how fun to have it made with so many fabrics that were accumulated through the years. 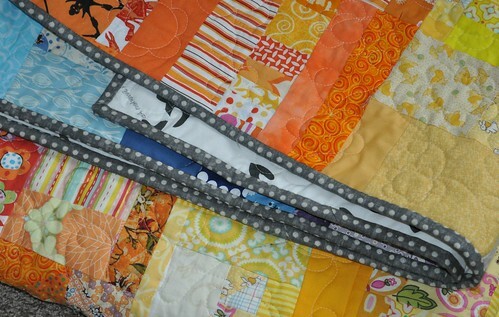 I hate it when my backing gets folded up and quilted....gggrrr. Love this Vicki! What a fun idea for a using some memorable fabrics! Fantastic! Putting them in rainbow order does bring some comforting order. I can see why you love it!